CELEBRATION, Fla.–(BUSINESS WIRE)– On April 14th, Disney executives and resort industry representatives, along with a team of costumed Disney railway workers, officiated over the groundbreaking of The Walt Disney Company’s newest vacation ownership project — The Villas at Disney’s Wilderness Lodge — as they commemorated the “union” of two Disney resorts. Al Weiss, President of Walt Disney World Resort, was joined by George Aguel, Vice President/General Manager of Disney Vacation Development, Inc. (DVD), Cynthia Huheey, President of the American Resort Development Association (ARDA), and other guests at the site of Disney Vacation Club’s (DVC) fifth vacation ownership property, located immediately next to and adjoining the popular Disney’s Wilderness Lodge in the Magic Kingdom Park Resorts area. 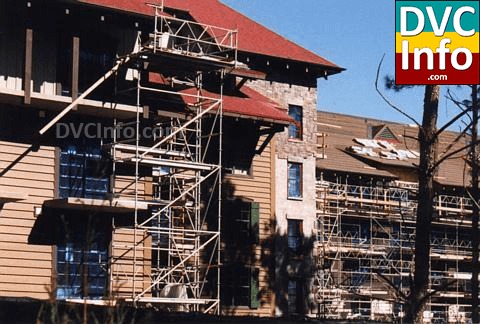 The Villas at Disney’s Wilderness Lodge is scheduled to open in January 2001. “This ‘union’ of a unique Disney vacation ownership offering with a well-established Disney hotel will create an unforgettable vacation experience for families everywhere for years to come,” added Weiss. Cynthia Huheey, President of the American Resort Development Association (ARDA), said: “With a near 1,000% growth rate globally since 1980 and $6 billion in annual gross sales worldwide, vacation ownership is the fastest growing segment of the resort industry. The Villas at Disney’s Wilderness Lodge will combine the unique benefits of Disney vacation ownership with the amenities of an award-winning Walt Disney World Resort hotel. The new resort is modeled on the success of the Company’s first mixed-use hotel project, i.e., Disney’s BoardWalk Villas at Walt Disney World Resort, which combines both standard hotel and vacation ownership accommodations. Plans for the proposed DVC resort call for the development of a 136-unit free-standing, five-story vacation ownership resort consisting of studio, one- and two-bedroom vacation villas on a 4-acre site adjoining Disney’s Wilderness Lodge. All units will feature either a pool, water or woods view. Also planned for construction are connecting walkways and full access to Disney’s Wilderness Lodge and its existing parking area, recreation, dining and dramatic lobby areas. The addition of a pool, health club and the expansion of existing retail space and quick-service dining will complete the project. Disney Vacation Club and Walt Disney World Resort officials Wednesday broke ground on the Villas at Disney’s Wilderness Lodge, a 136-unit, five-story time-share resort on 4 acres adjacent to Disney’s Wilderness Lodge.